“Any person capable of angering you becomes your master; he can anger you only when you permit yourself to be disturbed by him.” Epictetus. As indicated the post, Dealing with Bullies, any one of us can find ourselves in a situation where another person attempts to express their power over us. The people I’ve talked to in the last few days on the matter including the martial arts instructor who works with our kids have similar thoughts on dealing with bullies. We have to maintain our center by responding with things like “How sad, you have to push others around.” Or, “Why do you think I have bug eyes? Even if I do, I like my glasses.” Being aware of and accepting who we are is a big part of dealing with the bullies and petty tyrants of the world. As Taylor Swift and Carlos Castaneda have said, those who attempt to put us down or in our place by whatever means are a blessing in disguise. They simply provide feedback and motivation if we choose to see it that way. Sure it can hurt emotionally and even physically, but we can choose our attitude in responding to the situation. We can manage our reaction and adapt as necessary. We can talk to others about it to see if we can drum up support. We can share our own feelings. Relative to the business of you paradigm its critical for us to remember who we are and what we want to do with our lives. In doing so, we more readily resist when others try to be our master. When a petty tyrant tries to torment us in whatever way, we can seize the opportunity to learn some detachment. We can remember petty tyrants reflect aspects of ourselves. When we get angry, upset or feel sorry for ourselves, we have given our power away to them. We’ve made a choice to not be the master of our own life. It’s our decision to control ourselves. Our petty tyrant doesn’t control us. For the bullies in our lives, why should we care what they think? Why should we fear not being their friend or in their crowd. We have given ourselves a purpose in life and the bullies and tyrants are obviously saying they don’t want to be a part of the vision we have for ourselves. As Dr. Elizabeth Waterman who deals with teen suicide says, “Somebody who is bullied and has a lot of coping skills, support in their family and in other friends, is probably more resilient than somebody who doesn’t perceive others as being supportive or has low self-esteem, identity issues, or depressed mode.” from Teen Suicide: Is Your Child at Risk? 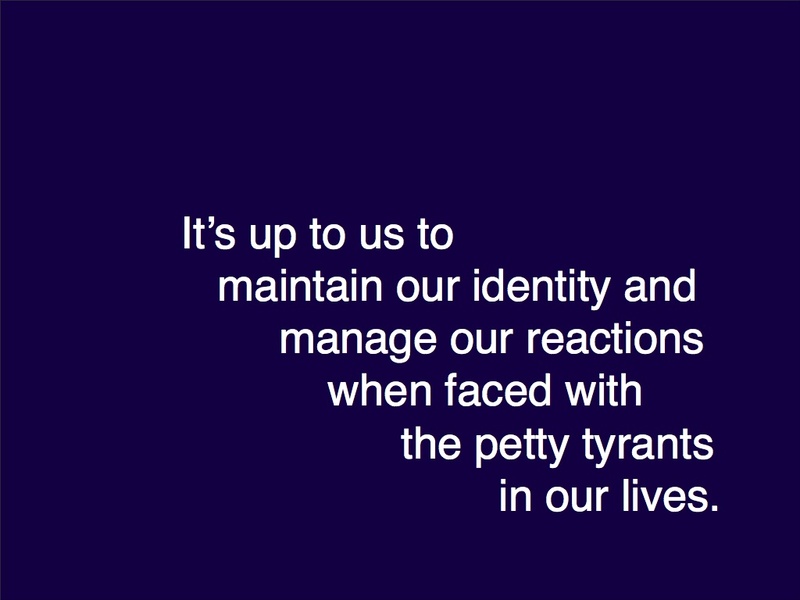 It’s up to us to maintain our identity and manage our reactions when faced with the petty tyrants in our lives. The bullies in our lives are nothing more than petty tyrants we give our power away to. That’s a good view on bullies.